The First Street Community Center is thrilled to announce that Chad Elliott will be putting on a live concert for adults (but youth friendly) in the Uptown Theatre Sunday, April 26th, starting at 7pm, doors open at 6:45pm. – Read Bob Everhart’s full review here. Mike @ Baumann’s on First St. SW, Mount Vernon, Iowa. Tickets are also available at the door or on the web at http://chadelliottlilfest.bpt.me. 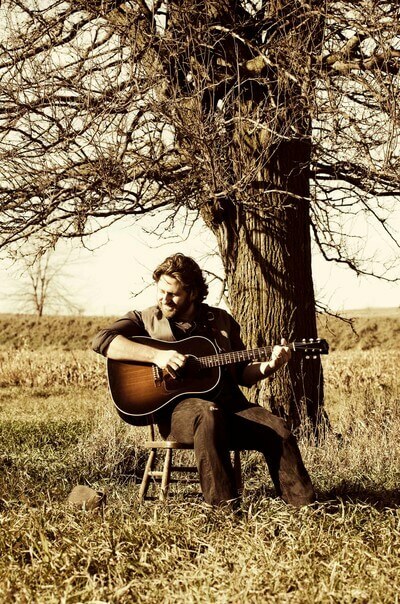 He has also shared the music stage with greats such as: Eric Church, Lonestar, Counting Crows, Brantley Gilbert, R.L. Burnside, Odetta, Tom Paxton and Loudon Wainwright III, among others. Elliott has released 19 full-length albums since he began his songwriting career. In 2009, he released “Redemption Man.” Elliott worked with producer and guitarist Bo Ramsey (Lucinda Williams, Greg Brown) on this album to achieve it’s distinctive electrified roots sound. It also features Pieta Brown on the song, “Same, Old Way,” which was the 2009 Woody Guthrie Festival song contest winner as well as a 3rd place winner in the 2009 International Songwriting Contest for the Americana category. Two other songs on this album, “Redemption Man,” and “Illinois,” won Elliott a new folk finalist spot in the 2008 Grassy Hill Kerrville Folk Festival. Elliott released “So Sang the Crow” in March of 2013. He visited Basecamp Recording Studio in Montana to lay the tracks. Basecamp Recording is run by Chris Cunningham of the folk-duo Storyhill. Cunningham produced the album, adding his meticulous attention to detail to the well-crafted project. “So Sang the Crow” speaks to the souls of those “fighting the good fight” in a life of challenge. Currently, Elliott is working on his 20th original album. He has been traveling to Nashville, TN to record the new album with producer/drummer Ken Coomer of Wilco and Uncle Tupelo. He expects to release the album in the fall of 2015.